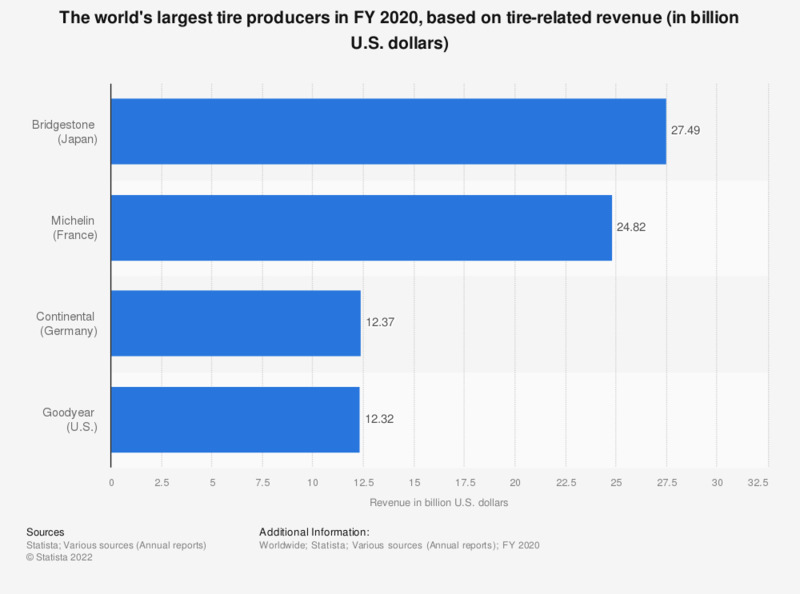 This statistic shows the world's largest tire manufacturers in 2017, based on tire-related revenue. Continental's revenue from its tire division amounted to around 12.6 billion U.S. dollars in the 2017 fiscal year. The ranking of the world’s largest tire manufacturers is dominated by European and Asian manufacturers. Third–ranked Goodyear Tire and Rubber Co. and twelfth–ranked Cooper Tire and Rubber Co. were the key tire makers with headquarters in the United States. Since labor costs are the second largest driver of tire production costs, Asian manufacturers are able to benefit from low wages in the majority of their plants. In terms of tire-related sales revenue, Japan's Bridgestone continues to be the main player in the tire manufacturing business, while Germany's Continental is the major player based on overall revenue. However, Continental is active in various fields, including the production of tires, brake systems, tachographs and automotive safety, while Continental’s closest rival, Bridgestone of Japan, generated around 83 percent of its revenue from the tire segment in the 2016 fiscal year. Continental was founded in 1871 as a rubber manufacturer. The company generated almost 40.55 billion euros in revenue, and had around 216,000 employees worldwide in the fiscal year of 2016. That same year, some seven percent of Continental’s worldwide sales went to the company’s research and development division. Following a takeover bid in 2009, Schaeffler AG became Continental’s controlling shareholder. Today, the manufacturer of roller bearings owns just under 50 percent of Continental shares. The figures were converted at average annual currency exchange rates. Everything On "Tire market in the U.S." in One Document: Edited and Divided into Handy Chapters. Including Detailed References.